This is an era of disruption. Technology innovation, the intensifying march of digitization, and the cumulative effect of the "big exponentials" - the laws of accelerating growth governing processing power, storage, and bandwidth - are shattering, reshaping, and redefining economics in and across industries. Companies in the technology, media, and telecommunications (TMT) sectors are in the vanguard, bringing these new opportunities to market - even as their legacy businesses are threatened by them. TMT companies have begun to engage in end-to-end digital transformation by digitizing the value chain in their core businesses and enter new disruptive businesses. Still, they are subject to massive dislocation and attack. In this age of exponential growth, value creation remains the best metric of superior strategy, transformation, and execution. TMT companies have done a good job of rewarding their shareholders in the first half of this disruptive decade, returning 20% (Media), 14% (Technology), and 11% (Telecommunications) in median annual total shareholder return (TSR) over the 2011-2015 period, respectively. To achieve breakthrough growth in the future, TMT companies need to make bold and disruptive moves. We have witnessed the building of a new, global digital ecosystem that is based on the exponential growth of smart devices, high bandwidth connectivity, data analytics, and cloud computing. This ecosystem is maturing fast and allowing organizations to benefit from many disruptive technology waves. In their recent report, "Unleashing Technology, Media, and Telecom with Digital Transformation" , the Boston Consulting Group shines a light on three trends in particular: artificial intelligence (AI), the Internet of Things (IoT), and cybersecurity. Understanding these trends may give companies in the sector a competitive advantage. AI can help companies automate their customer support or network operations. Internet-connected devices can help technology vendors improve business processes and increase efficiencies in manufacturing, transportation, logistics, and utilities companies. And a new focus on cybersecurity can help TMT companies prevent breaches, to which they are particularly vulnerable. While AI, IoT and cybersecurity have not actively fueled growth for TMT companies in the past, they are all now active targets of venture funding and will undoubtedly shape future performance. 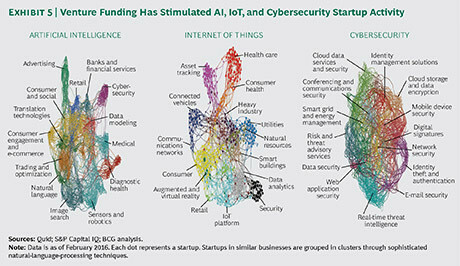 Using Quid, BCG shows specific areas within AI, IoT, and cybersecurity that have received the most venture funding. 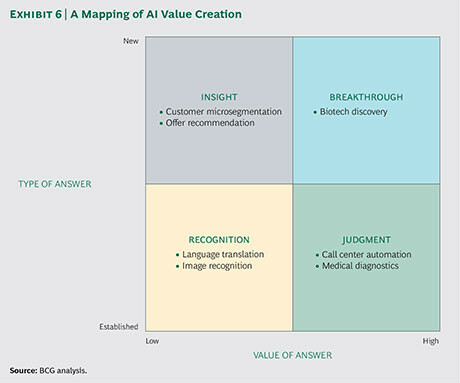 Companies that transform their value chains to take advantage of AI will have a competitive advantage in improving business productivity and deepening customer engagement. AI applications under development will offer emotional as well as cognitive intelligence. They will be able to detect individuals’ moods, anticipate how people are likely to react in a given situation, and know how to motivate them to act. The field of AI is broad, so it helps to frame where and how machines can improve performance. Along one dimension, AI can derive low-value answers (identifying a cat, for example, through basic image recognition) or high-value answers (diagnosing a stress fracture, for example, by reading a CAT scan). Along another dimension, it can generate either known answers more swiftly than humans or “unknown” answers. Humans, for example, cannot easily process hundreds of thousands of retail sales to generate insight. Plotting these two dimensions reveals clusters of business challenges and opportunities of varying degrees of sophistication and insight. TMT companies have an opportunity both to use AI to reimagine their own business models—by, for example, automating customer support or network operations or gaining customer insight—and to sell AI solutions to other companies. With market revenues projected to exceed $300 billion by 2020, IoT is a big deal for TMT. “You cannot connect 50 billion things that have never been connected before and not achieve tremendous new value,” according to Cisco CEO Chuck Robbins. Technology companies will have opportunities to create applications and platforms for specific industry uses. Manufacturing, transportation and logistics, and utilities are expected to be the largest customers for IoT products and services, accounting for a combined value of $135 billion by 2020. Services, apps, and analytics at the top of the IoT stack are expected to grow by 40% annually, faster than sensors and hardware at the bottom, reaching roughly $150 billion by 2020. In addition, the growth of blockchain technologies is being propelled in part by the opportunity to become the ledger for IoT transactions. IoT has the potential to widen media companies’ content distribution so that many more devices and surfaces—such as refrigerators and tables—can display digital content. IoT can also enhance storytelling through AR and VR. The rollout of 5G infrastructure in the next five or so years offers telecommunications operators the chance to embed their networks with more intelligence and help facilitate the development of services built around AR and VR, the tactile internet, and connected cars. Verizon’s hum service, for example, provides speed alerts and vehicle location, monitors vehicle diagnostics, and can connect with live mechanics. Barely a week goes by without a news report of yet another security breach at a major company or government agency. These breaches damage credibility, brand, and trust. More than 5.3 billion records have been lost or stolen since 2013, so security breaches represent an existential threat to all companies. Given the reach of the new digital ecosystem, cybersecurity is growing ever more critical, and companies from many industries are rushing to enter the field. Private equity firms and other companies have also gone on buying sprees , and companies have been “snapped up for the technology or in-demand security engineers,” according to the Financial Times. With their global reach and vast stores of customer data, TMT companies are especially vulnerable to such breaches, but they can also help provide the solutions that will fortify their networks, protect their customers, and generate value and competitive advantage. Symantec’s acquisition of Blue Coat, for example, drove Symantec’s share price from $17.30 prior to the announcement to nearly $20 within a week and to more than $21 within a month—a stark contrast to the sinking stock performance of many acquiring companies. In this case, investors were betting on the improved long-term growth potential of the combined company, which enhances Symantec’s security offering in the cloud. To be sure, companies in the TMT sector still face plenty of obstacles, legacy media companies in particular. So how can the businesses remain competitive in the digital age? By understanding and harnessing the power of AI, cybersecurity and the Internet of Things.